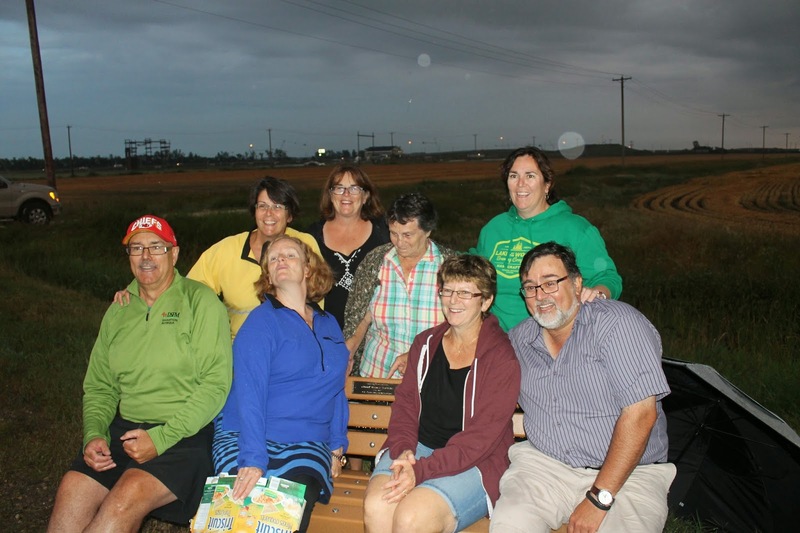 Approximately 50 family and friends of Martial LaFleche, gathered for a celebration on August 21, 2014, to dedicate a bench on the Headingley Grand Trunk Trail. The bench is a tribute to the LaFleche family who are long time residents of Headingley, dating back to farming the area since 1885. The year 2015 will make it the 130th Anniversary. Four generations of family members were present for the dedication. A lot of hard backbreaking work went into preparing the foundation for the bench. Here Karl Gompf, of the Headingley Grand Trunk Trail Association, mixes the concrete, assisted by Cecil and Roger Foidart and Mom feeling the pain. The weather was rainy, to say the least. Or better said, “it was brutal”. It poured and poured and then poured some more. But, in the tradition of the LaFleche family, the party must go on. A supper was held in the original farm house, with the usual trimmings and celebration. Then there was a break in the weather (as if planned) and everyone headed down to the Trail. The geese loved the weather and showed up for the event "in flocks"
The bench is located where the LaFleche Road intersects the Trail just west of the perimeter trail head. The LaFleche Road is so named, but during the middle of a rain storm, it is not advisable to drive down the road (Farm Road). Everyone was warned, but someone must not have received the text, as we watched the on-coming lights that seemed to stop in the middle of nowhere, and were still there when we left the dedication. Jean Robson, representing the Headingley Grand Trunk Trail Association, welcomed those in attendance on such a dreary night, and how proud the Association was to have the bench complement the many users of the Trail. Cecile Foidart and other family members made presentations on behalf of the family to commemorate and recognize the families many years of enjoyment on this land. 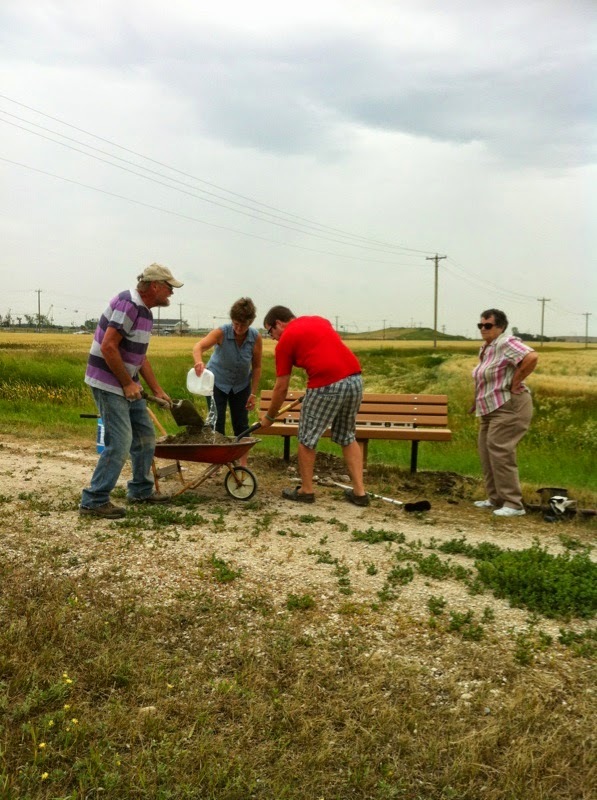 Years from now they can tell their grand kids stories of the family farm and take the out to this special bench. As I looked south from the bench, I overheard someone say, they remembered the days when the forefather’s used to head out during harvest on Monday morning with 40 men and 40 horses and stayed all week, coming back on Sunday or when rations ran out (food or drink??). I could vividly imagine this tonight, as I looked off into the clouds, mist and fog and saw the the horses disappear into thin air.